2 Bedroom Semi Detached Cottage For Sale in Leicester for Guide Price £280,000. With the original cottage dating back to the 17th century the property has been completely refurbished by the current owners. It boasts new fittings and fixtures throughout including SMEG kitchen appliances, hardwood framed double glazed windows and under floor heating powered by the gas boiler. The property has been thoughtfully upgraded throughout boasting a modern feel whilst keeping traditional characteristics such as the original, exposed feature stone walls in the lounge and dining room. The kitchen is in keeping with the style being solid oak freestanding units with granite worktops. 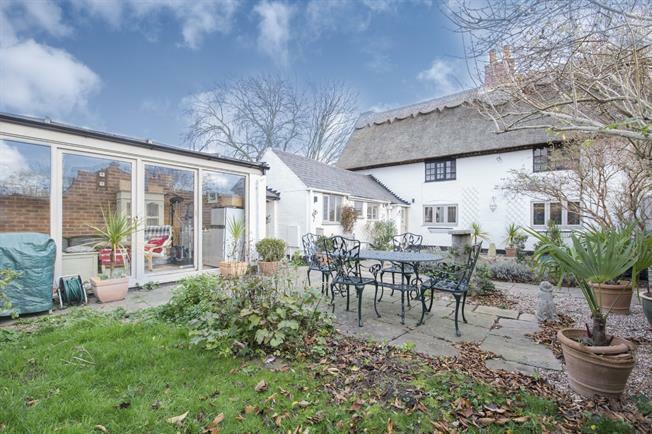 To the outside is a bonded resin driveway comfortably fitting two cars and the property also boasts a refitted (2017) thatched roof completed by a master thatcher. Being entered via a wooden stable door leading to limestone tiled flooring the entrance hall benefits from under floor heating powered by the gas boiler and allows access to the breakfast kitchen, utility cloakroom stairs to the first floor and lounge. Continuing the limestone tile and under floor heating the kitchen has been designed with the properties character in mind with freestanding oak units with granite worktops, a range style oven a dining table and chairs and space for fridge freezer.